Johnny Chance, aka Spyman, is an agent with Liberty. This covert governmental organization which is tasked with protecting America from all manner of dangers, has its ultra-secret headquarters beneath the Statue of Liberty. Its sizable facility consists of at least six floors beneath the surface on Libery Island. Agents for this agency can come and go via a submarine berthing area although there are other, less involved ways of entry. The name 'Liberty' is not, apparently, an acronym for anything or at least none is ever mentioned. The agents for this secret bureau do tend to go around dressed in a skin tight full-body suit of a bright red color, including a piece that covers all the head except the face and which has a visor. When out on the street 'in disguise' Spyman is known to cover up with a trenchcoat, although he still wears the headress. When an agent is needed, the torchlight from the Statue changes to a red glow. 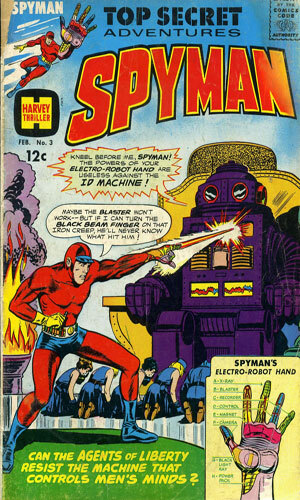 Later when he is fitted with his mechanical hand, Spyman is able to receive a signal via it causing it to tingle. It is not known if before the accident which would change his life dramatically, Johnny Chance was the lead agent or just one of its best but when he and a fellow agent named Mike discovered enemy agents in the headquarters setting up an atomic bomb, he took it upon himself to check it out. He incapacitated the two bad guys but not before they had armed the device. While removing the detonator from the bomb, the explosive went off in his hand destroying that appendage. The lead scienctist for the organization, a Dr. Vane, had been working on a 'electro-robot hand' which housed many remarkable mini-gadgets. Unfortunately to that point the human body consistently rejected being connected to the device but the explosion that cost Chance his hand had radioactivity in it which somehow made his body more accepting so the metal hand was able to be grafted onto Chance's writst. In the first version of the hand, there was an 'Electro-Blast' from his index finger, an X-Ray probe on his middle finger, ring finger housing the 'ring-control-sections' (? ), and a recording device and transmitter in the pinky. The thumb had a photography unit. The pads of the palm had electro-magnetic plating which would allow him to adhere to walls for climbing. From the center of the palm could be shot a cone of opague rays 'obscuring the presenced of light' which he called a Black Beam. When severe damage to the hand was taken at the beginning of the second recorded adventure, Dr. Vane revealed the latest 'model', a hand that had detachable fingers, each digit having a different use. These extra fingers are carried in a utility belt around his waist. Some of these included a flame thrower and a finger grenade. We learn very little about Chance other than the facts that he is is in his late 20s or early 30s and is in peak physical condition. A handsome dark haired man, he is clean shaven and as fearless as they come. Where he came from or anything else remains a mystery. The comic book company Harvey was never known for its superheroes even in the heyday of new the Golden Age of comics, the mid 60s. It focused on lighter titles attracting usually younger audiences with characters like Richie Rich and Little Lulu. 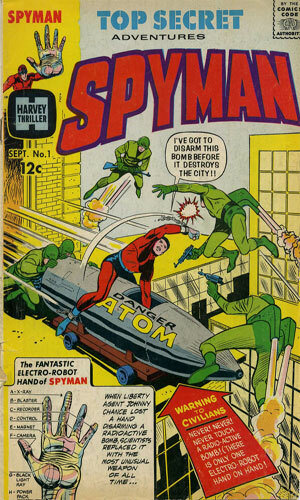 One of its rare branch out of this genre, however, was the very short-lived Spyman. Spyman, aka Johnny Chance, was remarkable for a couple of reason. The first is something I would not have known without the sites listed below passing it on to me. The well respected graphic artist Jim Steranko was one of the creators of the series and apparently the cover and at least some of the first issue represent the first professional work he did. Steranko would, a decade later, take an okay Nick Fury, Agent of S.H.I.E.L.D and breath excitement and sophistication into the brand which would make it a comic book legend. The second is being, as far as I know, one of if not the first use of cyborg technology in a spy-fiction genre. A half decade before terrific author Martin Caidin would give us Cyborg, the first Steve Austin, Six-Million-Dollar Man, Spyman had some pretty impressive weaponry at the end of his arm. It was in the same league with Iron Man's gauntlet and the Mandarin's rings. Way cool. Sadly for me as a kid hooked on comics in the 60s, I never saw it. Maybe if I had and others had as well, there might have been more than just the 3 adventures. Spyman Johnny Chance is a lead agent with Liberty when agents of MIRAGE invade HQ and leave an atomic bomb. Chance loses his left hand disarming it. Given a hi-tech robotic hand, he goes up against the Whisperer, enemy agent who has infiltrated HQ. 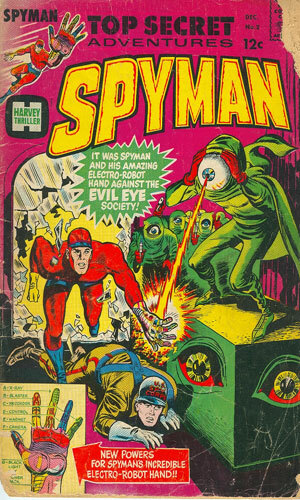 Going up against 'the psycho known as Cyclops', Johnny Chance, aka Spyman, takes on the Evil Eye Society, a nasty group of criminals and terrorists who wear a fake third eye as a symbol of membership. A dying Liberty agent is taken to Dr. Vane and in his last breath warns him to 'kill the Id'. That turns out to be the Id Machine, a computer with sentience that has created an army of humanoid robots to serve it. Johnny Chance, Spyman, encounters it on his own when he tries to help a beautiful woman. Coming at a time when gadgets and cool technology was the rage in anything dealing with spies, from Bond's Q Department to the Man from U.N.C.L.E. to Jim West's neat toys, it might seem that someone like Spyman would be a natural. Who knows why it never happened. Not really cool enough? Put out by a never-looked-at-by-teenage-boys Harvey Comics? I couldn't tell you. It just did not make it and looking back on it now I guess I understand. The series had boffo scientific knickknacks and some over-the-top bad guys but the series just did not have any, well, oomph. Back then I would have read it but since I never knew about it, likely others did not either. Spyman came and went. Quicly.